W.A.G.E. (Working Artists and the Greater Economy) is an organization that is fighting for minimum payments for artists in NYC. 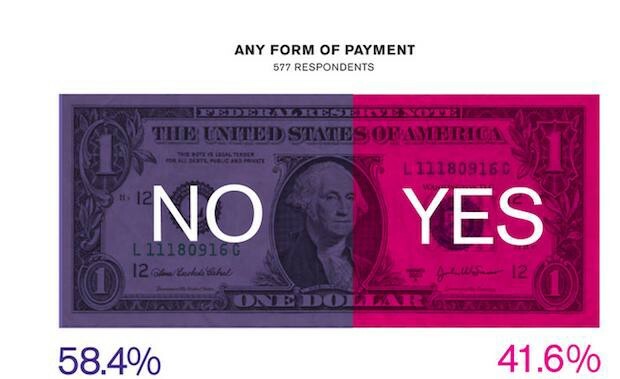 As part of their work, they surveyed NYC artists about payments they’ve received for exhibiting with non-profits. Hyperlink has some infographics displaying the results of the survey, but here’s the gist: most artists showing work at non-profits in NYC do not get paid. Alternatively, Canada has an organization called CARFAC (Canadian Artists Representation/Le Front Des Artistes Canadiens). The organization was founded in 1968 in response to a National Gallery of Canada project that intended to use the works of Canadian artists without providing compensation. The non-profit CARFAC is now the voice of the Canadian artist community. They publish an annual fee schedule, which a list of minimum fees that artists should be paid for the use of their work. The schedule is very detailed and slightly complicated to someone (me) who isn’t well-versed in the art world, but this section, outlining payment minimums for a solo show, is a good example of the kind of fees that artists might garner (group exhibitions get much lower fees). Since payment is guaranteed in Canada and not in the U.S., I wondered why an artist might choose to live here. My roommate Mona Kamal is a Canadian artist living in New York City. I spoke with her briefly about the difference between Canada and the U.S. for artists, and why she chooses to be here. Logan Sachon: What is it like to be an artist in Canada versus the U.S., as far as compensation? Mona Kamal: Artists in Canada do get fees for exhibitions in public galleries, and there is a good granting system, but the money that artists receive within this system is small. An artist can live very meagerly with this sum. In the U.S. there isn’t a funding structure like there is in Canada, but the art market is so much larger, the art market allows artists to be able to make a living through selling their work. What is it that has allowed or encouraged the Canadian system of artist pay versus the U.S. system (which I gather is no system)? Canada has a long history of government funding for the arts, beginning with the Canada Council forming in the 1960s and then Canadian artists began public galleries called the Artist Run Centre — all these galleries pay artist fees. During this time the CARFAC also started. Unfortunately the U.S. doesn’t have a government-based funding structure for the arts. They do have the National Endowment for the Arts, but that got heavily cut in the 1990s when Andre Serrano made a piece called “Piss Christ” [You’ve seen this. It totally outraged Republicans, and Jesse Helms fought to ensure federal dollars never went to fund such filth ever again — LS]. There is little funding in the organization and it has a lot of red tape. Why, as a working artist do, you choose to be in the U.S. rather than Canada? It seems like there would be better opportunity for pay there, because of CARFAC? I choose to be in New York, not the U.S. Being here enables me to be exposed to an international art scene that has international artists and curators. This is what opens up a world of opportunity for me as a working artist. There is “pay” for artists in Canada, but it is not enough to sustain yourself. 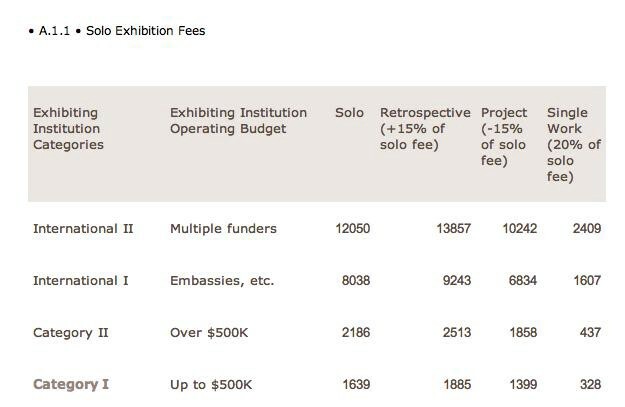 There are more non-profit galleries in New York City than all of Canada. It also is difficult to sell work in Canada, and being paid $1,500 for a solo exhibition isn’t enough to make a living. You still have healthcare in Canada. Is there an opportunity for you to get healthcare here, as an artist? I can get health care through teaching (at Parsons), and there is also the Freelancers Union, which I find to be expensive. Healthcare in the U.S. is an entire other issue. It’s a system that’s broken and needs to be fixed, but in my opinion has gotten so bad that I think it’s too late to fix. Even if I had insurance here I would still keep my Canadian Health insurance because it offers me so much more at zero cost. I’m taking a trip to Canada soon just to go have a physical. What are some ways the working artists you know here supplement their income? (I know you teach …) Are artists in Canada able to spend more time on art, because of the payment system? I think artists do anything they can to supplement income. Many artists freelance because that way they can choose their schedule. I actually feel like I focus on my art more now than I did in Canada, though this may be because of a change in my attitude and wanting to make more time for my art. Have you been paid for shows here? I think I’ve been paid once, in all the time I’ve been here. Whereas I went to Toronto last month and, because of CARFAC, I was given a stipend for travel and a fee.